Up close and personal with the lady slipper orchid. There was too much to show you in one post from our recent trip to Pine Grove Park outside Liverpool, Nova Scotia. Besides tons more rhododendron images (see previous “Day Trip” post) the place was blanketed with lady slippers. More than I have ever seen in one spot before. Absolutely amazing. 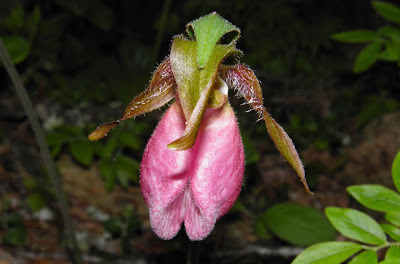 Lady's slipper orchids, lady slipper orchids or slipper orchids are the orchids in the subfamily Cypripedioidea, which includes the genera Cypripedium, Mexipedium, Paphiopedilum, Phragmipedium and Selenipedium. They are characterised by the slipper-shaped pouches (modified labellums) of the flowers – the pouch traps insects so they are forced to climb up past the staminode, behind which they collect or deposit pollinia, thus fertilizing the flower. Different species of lady slippers grow throughout the United States, Canada, Europe and Asia. 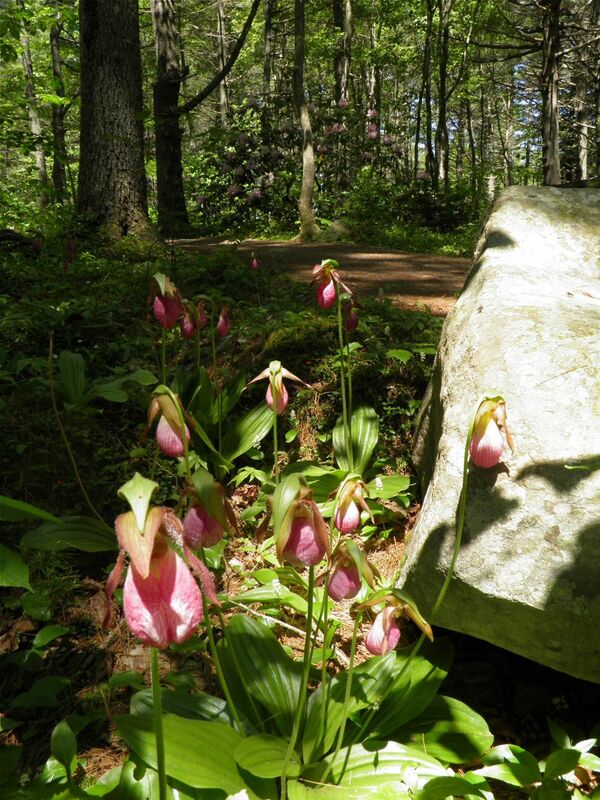 The most common of our native four lady slipper species is Cypripedium aucaule, or pink lady slipper (or sometimes white, which is much rarer). 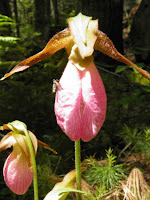 The other three are yellow, ram’s head, and showy lady slipper. They are fussier in their habitat requiring gypsum in the soil where they grow. To be honest, I have never seen any of the other three. We have a few other native orchid species as well, although they are much more rare throughout the province and some are protected species. Hopefully I will be able to photograph them soon. In the right conditions lady slippers can reach heights close to 24 inches. It is very unusual to see them growing in much more than a clump of two to three. Most often they stand alone, although they often have “close” company a few feet away. That was not the case in Pine Grove. In the shady parts of the park, among the rhododendrons, they grew in bunches upwards of a dozen. Pink lady slipper requires a specific fungus in the soil to grow so they will not regrow if you try to transplant them in your home garden. Also, if the plant’s bloom does not go through its entire growing cycle it will not regenerate. So don’t pick them. It is best to enjoy them as we did, with our camera, and an appreciative attitude. 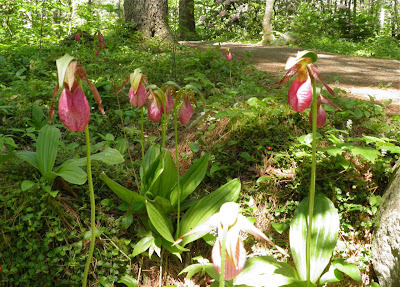 Pink lady slippers are admired throughout the Maritime Provinces. The pink lady slipper was adopted as the provincial flower of Prince Edward Island in 1947. The park is (still) located on Route 8. Just take a right at the bottom of Exit 19 on Highway 103. Hwy. 103 is the main highway running from Halifax adjacent to the old South Shore "coast" highway. The park is less than a kilometre from the exit on the left. It's about 1 hour 20 minutes from Halifax; 2 hours if you take the 300 series highways "scenic drive" along the coast through Chester, Mahone Bay, Bridgewater, etc.